Purpose To evaluate the accuracy of percutaneous fluoroscopic injection into the spinal cord of a spine phantom utilizing integrated navigational guidance from fused flat panel detector CT (FDCT) and MR datasets. Conventional and convection-enhanced delivery (CED) techniques were evaluated. Materials and methods FDCT and MR datasets of a swine thoracic spine phantom were co-registered using an integrated guidance system and surface to spinal cord target trajectory planning was performed on the fused images. Under real-time fluoroscopic guidance with pre-planned trajectory overlay, spinal cord targets were accessed via a coaxial technique. Final needle tip position was compared with a pre-determined target on 10 independent passes. In a subset of cases, contrast was injected into the central spinal cord with a 25G spinal needle or customized 200 µm inner diameter step design cannula for CED. Results Average needle tip deviation from target measured 0.92±0.5 mm in the transverse, 0.47±0.4 mm in the anterior-posterior, and 1.67±1.2 mm in the craniocaudal dimension for an absolute distance error of 2.12±1.12 mm. CED resulted in elliptical intramedullary diffusion of contrast compared with primary reflux observed with standard needle injection. Conclusions These phantom feasibility data demonstrate a minimally invasive percutaneous approach for targeted injection into the spinal cord utilizing real-time fluoroscopy aided by overlay trajectories derived from fused MRI and FDCT data sets with a target error of 2.1 mm. Intramedullary diffusion of injectate in the spinal cord is facilitated with CED compared with standard injection technique. Pre-clinical studies in large animal models are warranted. Modern x-ray fluoroscopic systems can perform high-quality flat panel detector cone beam computed tomography (FDCT) for both diagnostic and interventional purposes.8–20 Integrated navigational software can then aid in planning a needle trajectory and provide real-time guidance for percutaneous procedures throughout the body.8–10 14 15 17 18 20–23 The advantages of this approach include the ability to perform percutaneous procedures in an interventional suite or hybrid operating room rather than in a CT or MRI suite, where performance of image-guided procedures can be more cumbersome.8–10 15 17 18 23 Further, FDCT data acquired at the time of a procedure can be rapidly and automatically fused with MRI sequences obtained prior to the procedure in real-time to allow three-dimensional navigational guidance toward FDCT occult targets.9 24 This application may be particularly useful for soft tissue targets that are easily visualized with MRI but difficult to resolve with CT, such as the spinal cord. In this proof-of-principle study we aim to assess the accuracy of needle placement with fluoroscopic guidance incorporating FDCT-MRI fusion data for navigation in a cadaveric swine phantom. Distribution of contrast injectate was also evaluated with a conventional spinal needle and a customized step design cannula for convection-enhanced delivery (CED). The CED technique engages pressurized fluid dynamics to distribute macromolecules more efficiently than regular, non-continuous pressurized injections.25 26 Given the small dimensions of the human spinal cord, a high degree of target accuracy with a low margin of error and maximum distribution will be needed to preliminarily validate this approach for intra-spinal injection applications. A swine spine phantom was developed by en bloc resection of a formaldehyde-preserved spinal column including the lower seven thoracic vertebral segments from an adult pig (24 cm length x 14 cm width x 8.5 cm height). Paraspinal musculature and overlying subcutaneous fat was carefully preserved along with intact proximal ribs, vertebral bodies, intervening discoligamentous structures, spinal cord, and bilateral proximal nerve roots. The spinal column tissue block was then placed into a rectangular open-top plastic container measuring 26 cm x 16 cm x 10 cm and embedded in approximately 3.0 liters of Knox gelatine (2% concentration; TreeHouse Foods Inc., Oak Brook, IL). When not being used, the phantom was stored at 4°C. The spine phantom was imaged on the day of the experiments on a 1.5 Tesla General Electric (GE) Genesis Signa scanner (GE Healthcare, Milwaukee, WI). This included a 3D T1-weighted spoiled gradient (SPGR) sequence (TE=9 ms, TR=31 ms, flip angle 70⁰, slice thickness 1 mm, no gap) and a 3D T2-weighted fast spin echo (FSE) sequence (TE=88 ms, TR=2000 ms, echo train length=19, slice thickness 1 mm, no gap). For both sequences, slice acquisition was in the coronal plane. A post-injection MRI was obtained 30 min after delivery of the infusate and included acquisition of a 3D T1-SPGR sequence. The spine phantom was placed on the procedure table in the neurointerventional angiographic suite (Artis zee biplane, Siemens, Forchheim, Germany). Preparation and targeting were performed similarly to previously described methods for a head phantom study.27 Briefly, after an 8 s FDCT was performed (syngo DynaCT, Siemens, Forchheim, Germany), the FDCT and MRI data sets were automatically fused using the FDCT integrated guidance system (figure 1, syngo iGuide, Siemens, Forchheim, Germany). Minor manual adjustments were performed by a fellowship trained neuroradiologist (jft) to ensure accurate FDCT/MRI image registration. CT and MRI registration was performed with both 3D T1-SPGR and 3D T2-FSE sequences, although we found that the most accurate auto-registration of bony landmarks was achieved with the CT and 3D T1-SPGR sequence. The FDCT acquisition and MR fusion steps were repeated independently for every needle pass. FDCT imaging parameters were as follows: kVp: 90 kV, acquisition length: 8 s, slice thickness: 0.46 mm, field-of-view (matrix): width=236 mm (512) and height=236 mm (512), pixel size: 0.46 mm2, mean dose area product per FDCT acquisition: 1615±179 uGy-m2. A destination target designated as the central canal of the spinal cord was selected in the guidance software while windowed to the MRI data set to simulate guidance to an FDCT occult spinal cord target (figure 1). The central canal was selected as it represents an occult target on CT and a central, readily identifiable spinal cord landmark on MRI. A point of entry site was then selected on the dorsal surface of the phantom with the surface-to-target trajectory extending along an inter-laminar approach through the ligamentum flavum and into the dorsal epidural space. The surface-to-target trajectory was evaluated with FDCT windowing to avoid contact with bony elements during the trajectory. No more than two needle passes were performed at a single inter-laminar level and each of these passes were performed on opposite sides of the spine to avoid contact with previous needle tracts that could potentially influence guidance. Registered 3D FDCT and T1-weighted MR datasets preferentially windowed for CT weighting with overlay of pre-planned target trajectory (green line, A– C). The target was selected when windowed to the MRI data set and the entry site was selected when windowed to the FDCT data set. Axial (A), sagittal (B), and coronal (C) images are displayed to demonstrate a percutaneous inter-laminar approach to the spinal cord central canal target. (D) Positioning of the outer cannula based on laser crosshairs for alignment with the planned trajectory. The trajectory based on the CT-MRI fusion planning datasets is superimposed on lateral (E) and ’bull’s-eye'. (F) Fluoroscopic projections to aid in needle guidance to the pre-determined target. Scale bars in A–C, E, and F = 10mm. Targets were confirmed and the flat panel detector was automatically moved to the correct in-line or ‘bull’s-eye’ projection (figure 1). The positioning was checked using maximum fluoroscopic magnification setting (11 cm field of view). A square sticker was placed over the hub of a 6 cm, 15-gauge Murphy bone biopsy cannula (Cook Medical, Bloomington, IN) and a crosshair was manually drawn on the tape for alignment with the system’s laser crosshairs as previously described.27 On alignment, the cannula was advanced until the ligamentum flavum (LF) was reached with intermittent fluoroscopic guidance. Once fluoroscopy confirmed the outer needle tip position at the LF, the inner stylet was removed and a 12 cm, 25-gauge spinal needle was carefully advanced in a coaxial fashion to the final target position based on fluoroscopic visualization with trajectory overlay (figure 1). Over two sessions, 10 independent needle pass experiments were performed by two investigators with MRI fusion and MRI-based target selection. where d is the absolute distance between the needle tip and the pre-planned target, (xt, yt, zt) are the coordinates for the target determined prior to needle placement, and (xn, yn, zn) are the coordinates for the final needle tip position. Transverse, AP, and craniocaudal errors were calculated as (xt – xn), (yt – yn), and (zt – zn) values respectively. Needle tip to target error in the coronal (A), axial (B), and sagittal (C) planes upon final positioning of the inner spinal needle. Planning pre-procedure 3D T2-weighted MR dataset with pre-planned trajectory overlay (green) was automatically registered with post-procedure FDCT dataset with needle in place (yellow). Target error measurements were made between the spinal cord central canal target (center of green circle) and the needle tip as described in methods. White scale bar in lower right corner = 2mm (A–C). To evaluate intramedullary diffusion of contrast injectate with a standard 25-gauge spinal needle and a customized 16-gauge, MRI-compatible CED cannula (MRI Interventions Inc, Irvine, CA, USA. ), 10 mL Omnipaque (iohexol, 240 mg/mL; GE Healthcare, Princeton, NJ) and 0.3 mL Magnevist (gadopentate dimeglumine, 0.5 mol/L; Schering, Berlin, Germany) were mixed with 10 mL sterile saline. Using techniques described above, a conventional spinal needle (with uniform shaft diameter) was advanced to a target within the central spinal cord and 0.1 mL of the contrast mixture was manually delivered with a 1-cc gastight syringe over a 5-min period. Following a delay of approximately 25 min, the spinal needle was removed and a second FDCT was obtained to visualize iodinated contrast diffusion. The phantom was then transported to the MRI suite for acquisition of a 3D T1-SPGR at approximately 45 min post-contrast injection. A similar technique as above was used for a second pass during a different procedural session. 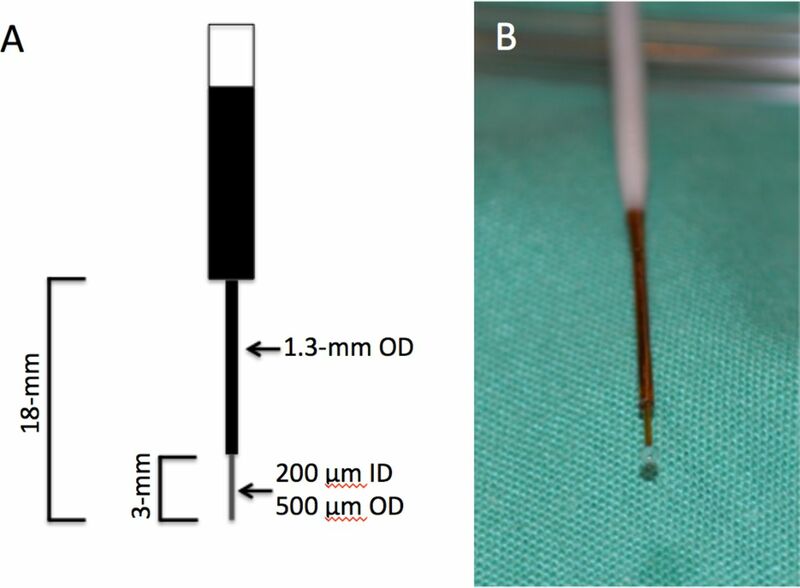 However, instead of a spinal needle, a custom step design cannula for CED with a 200 µm inner diameter tip and 3 mm step design (figure 3),25 was advanced to the target and 0.1 mL of gadolinium was manually delivered with a 1-cc gastight syringe over 5 min. For this pass, the inter-laminar spinal cord target was three vertebral levels distal from the spinal needle injection pass to avoid any potential overlap from the two injection sites. Step design cannula for convection-enhanced delivery for intraparenchymal injections. Cartoon schematic (A) and photograph (B) of the step design cannula for convection-enhanced delivery. ID, internal diameter, OD, outer diameter. Accuracy results are presented in table 1. The mean surface to target depth for all passes was 44.2 mm (n=10; SD=3.1 mm). The mean errors in the x (transverse), y (dorsal-ventral), and z (craniocaudal) dimensions were 0.92 mm (SD=0.56 mm), 0.47 mm (SD=0.43 mm), and 1.68 mm (SD=1.23 mm) respectively (table 1). One-way ANOVA revealed a significant difference between mean errors in the three dimensions (P=0.01). A post-hoc two-tailed Student t-test demonstrated a significantly decreased mean error (ie, increased accuracy) in the AP dimension compared with the craniocaudal dimension (P=0.008) and a trend toward increased accuracy in the AP dimension compared with the transverse dimension (P=0.06). The differences in mean error between transverse and craniocaudal dimensions was not significant (P=0.13). Based on target and needle tip locations, the mean needle ‘tip-to-target’ absolute distance error was 2.12 mm (SD=1.12 mm). The injection of mixed iodinated and gadolinium-based contrast via conventional technique with a 25-gauge spinal needle resulted in a significant reflux of contrast along the needle tract without remarkable intramedullary diffusion into the spinal cord parenchyma (figure 4A–D). In comparison, contrast mixture injection with a custom-made step design cannula for CED resulted in elliptical diffusion of contrast within the spinal cord parenchyma distributing more than one full vertebral length along the craniocaudal axis (figure 4E–H). Standard versus convection-enhanced delivery(CED) mediated intra-spinal contrast injection. A mixture of diluted iodinated contrast and gadolinium were slowly manually injected into the spinal cord using a standard 25-gauge spinal needle (A–D) and step design cannula with convection-enhanced delivery (EH). With standard technique, significant reflux of contrast is noted (A, arrowheads) along the needle tract on axial CT following needle removal. Minimal contrast dispersion within the spinal cord is seen on postinjection T1-weighted MRI in the axial (B), coronal (C), and sagittal (D) planes. In contrast, with CED technique (E), elliptiform diffusion of contrast is seen on post-injection T1-weighted MRI spanning greater than one vertebral body in craniocaudal dimension (G, H). T1 hyperintense signal along the epidural space relates to redistribution of partially refluxed contrast. Scale bars in A–H = 10mm. 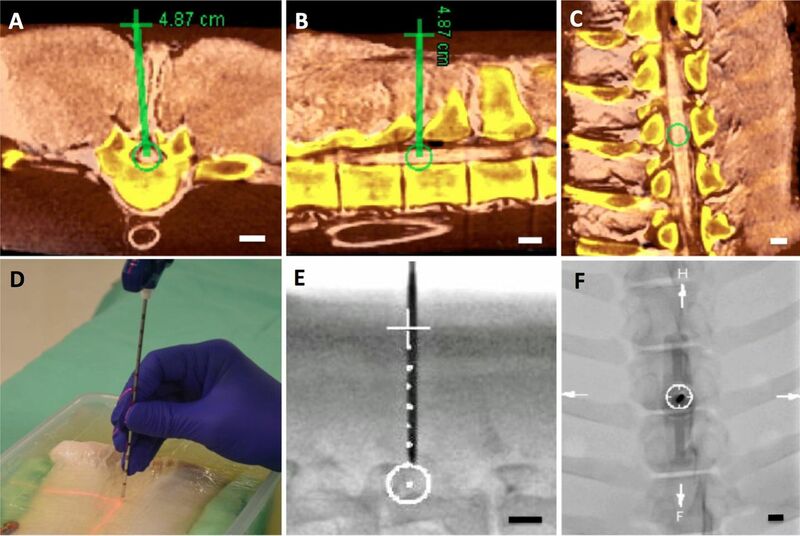 In this study we have developed a workflow employing needle placement into the spinal cord with fluoroscopic guidance which incorporates 3D FDCT-MRI fusion data for navigation in a cadaveric swine phantom. With this technology, we have shown needle positioning with tip placement accuracy within 2.1 mm of a pre-determined spinal cord target. Potential translational applications of this technology are numerous and include intramedullary delivery of stem cells or other therapeutics for patients with spinal cord injury1 28 and neurodegenerative diseases of the spinal cord such as ALS and spinal muscular atrophy,2 minimally invasive spinal cord or epidural biopsy, and direct delivery of chemotherapeutics for spinal cord tumors.4 This technology could potentially be modified for minimally invasive placement of drainage catheters in syringomyelia. Intra-spinal delivery of therapeutics would be greatly aided by accurate MRI guidance afforded with this technology. For example, preclinical studies in models of traumatic spinal cord injury have shown that graft survival and differentiation can vary depending on whether cells are transplanted into the epicenter or margins of a contusion injury.29 For many applications, high precision and MRI guidance are both needed to successfully target the ideal location for therapeutic delivery. Although our method, as proposed, can be employed broadly in modern x-ray angiographic suites using pre-procedure MRI data, we look forward to modifying this technique further in a custom XMR suite environment which combines a biplane angiographic suite and 3T MRI, such that patients can undergo both modalities intraprocedurally. In the XMR suite, FDCT and MRI datasets could be acquired intra-procedurally with identical patient positioning in cases where there is patient motion or concern for spinal cord deflection. Compared with traditional open surgical approaches for intra-spinal injection, the current approach offers three primary advantages: it is minimally invasive thereby minimizing procedure-related morbidity; targeting accuracy with a 2.1 mm margin of error; and uses MRI and FDCT for navigational guidance obviating the need for complex stereotaxic systems. Further, the procedure itself is performed in an interventional suite with FDCT guidance and is, therefore, less cumbersome compared with direct MRI-guided interventions. Squires and colleagues recently described an advanced MR-guided needle positioning system called SpinoBot for intra-spinal therapeutic delivery.5 Cadaveric targeting error with SpinoBot was nearly identical to results presented herein.5 Precise targeting will likely be necessary for intra-spinal delivery of therapeutics where accurate guidance to the ventral horn or within a post-traumatic spinal cord cyst_ENREF_4 may be necessary.29 Potential sources of targeting error in the present study include imperfect guidance of the spinal needle along the trajectory overlay as well as possible cord deformation and distortion with needle insertion. Further refinement and experience with this technology will certainly lead to progressive improvements in accuracy. Present data also suggest that intramedullary spinal cord injection is facilitated with CED. Less reflux of injectate and greater longitudinal (cranio-caudal) intraparenchymal dispersion of contrast was observed with CED compared with injection with conventional spinal needle, consistent with prior studies evaluating CED in the brain.25 30 Further in vivo studies in large animal models are warranted to validate these preliminary data. There are potential limitations to the proposed technique and in vivo validation in large animals demonstrating safety and efficacy will be necessary prior to clinical translation. Physiologic motion of the spinal cord relative to the bony spinal canal and paraspinous tissues could result in deformity and shear stress on the cord during and after intramedullary needle insertion. However, other percutaneous and open surgical techniques that do not incorporate a free-floating platform for needle injection are also prone to this limitation.31 Absence of motion in a cadaveric study such as this clearly does not fully mimic the challenges of targeting in a living patient. Patient motion and spinal cord deflection during the procedure introduces targeting challenges that this phantom study does not fully re-create. Nevertheless, refining the procedural pipeline for this navigation technology with a phantom as outlined in this study represents an important first step in translating this technology for spinal cord applications. MR acquisition and image registration could also be adversely affected in patients with extensive metallic spinal hardware, a limitation that similarly impacts direct MR-guided approaches.5 In such cases, guidance based on CT-myelographic images may be an alternative approach to consider. Finally, for this proof of concept study, only inter-laminar approaches were employed. For targets directly underlying osseous posterior elements, it may be necessary to employ a core-biopsy drill system to gain access to the dorsal epidural space with the outer trocar. In conclusion, these phantom feasibility data introduce a novel and minimally invasive percutaneous procedural pipeline for targeted injection into the intramedullary spinal cord utilizing real-time fluoroscopy aided by overlay trajectories derived from fused MRI and FDCT data sets with a target error of approximately 2 mm. Intramedullary diffusion of injectate in the spinal cord is facilitated with CED compared with standard injection techniques. Future in vivo pre-clinical studies in large animal models are warranted.
. Intraspinal stem cell transplantation in amyotrophic lateral sclerosis: a phase I trial, cervical microinjection, and final surgical safety outcomes. Neurosurgery 2014;74:77–87.
. Brain imaging with a flat detector C-arm: technique and clinical interest of XperCT. Neuroradiology 2008;50:863–8. Contributors All authors contributed to this work as follows:. JFT: contribution to conception, design, acquisition, analysis, drafting, and final approval. DLC: contribution to conception, design, acquisition, revision of manuscript, and final approval. MCM: contribution to acquisition, revision of manuscript, and final approval. PL: contribution to design, acquisition, revision, and final approval of manuscript. MRA: contribution to analysis, revision, and final approval of manuscript. SWH: contribution to design, analysis, revision, and final approval of manuscript. MRW: contribution to design, revision, and final approval of manuscript. TM: contribution to conception, acquisition, analysis, revision, and final approval of manuscript. EAS: contribution to drafting, conception, acquisition, analysis, revision, and final approval of manuscript. Funding This work was supported by NIBIB grant number 5R01EB012031 (SWH, MWW). Data sharing statement Available upon request from the corresponding author.